“Show me some skin!” That, at least, was the plea. Skin there was, and a lot of it. Flesh everywhere, on naked display in a steamy den of iniquity, itinerancy, and ice buckets. All and sundry – or perhaps mostly just the sundry – gathered from far and wide at Convivio’s swanky Tudor City digs, under the glowering eyes of Ivan Lendl-look-alike (and, it must be admitted, ultra-talented restaurant wine dude) Levi Dalton, for food, frolic, and bitterness. 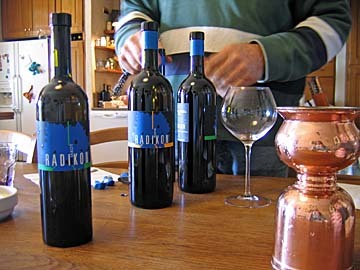 The latter stemming from an intense, in-depth assessment of a wine so unusual that it required an entirely new color category – orange – to go along with the previously-sufficient red, white, and pink. What is an orange wine? I’m not particularly glad you asked, because I have no better handle on the label than anyone else. 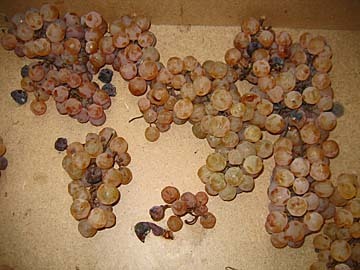 In general, the idea is that it’s a white wine produced with the extended skin contact characteristic of reds, which (especially among the darker-skinned white varieties) does indeed produce deeper, more intense colors ranging from straw through strawberry, and also renders the wine noticeably tannic. The wines are usually (but not always) left in the un-clarified, overtly cloudy state that seems to result. And that, at the core, is that. 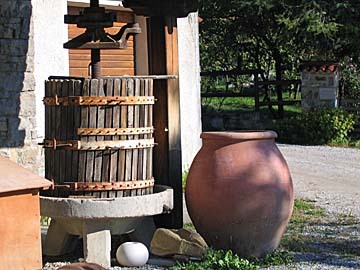 There are other philosophical branches and fields of practice within the orange wine family, some of them quite populous…non-filtration, avoidance of sulfur, aging in custom-made amphorae, and so forth. The category as a whole also maintains a good deal of contact with the ever-growing “natural wine” movement, but in truth the orange wines would more correctly be accused of being throwbacks to a much, much older type of winemaking, and “natural”-ness is no requirement for the style. For some, in fact, orange wines are anything but natural, no matter how historical a vinification they might represent. The transformation of a white wine into such a state, the argument goes, is as profound a manipulation as any. There’s merit to the argument, with only the caveat that the manipulation in question belongs to the class of grape-native cellar techniques that do not add or remove anything from the wine that doesn’t already exist in the grape, a distinction which, for some, makes a difference. The wines bear no relation to the truly transformational field known as molecular gastronomy, but they do share one thing in common with that realm: a direct and forceful challenge to one’s expectations of identity and typicity. But no matter one’s philosophical view, the wines are different, and – naturally – divide opinions. Some cannot abide them. Others love them with a religious fervor. For both, the price – usually elevated in comparison to “normal” whites – is a limiting factor, but one surpassed by availability; there aren’t many of these wines to begin with, total production often ranges between limited and anecdotal, and thus they’re notoriously hard to find. Many enthusiastic wine drinkers will pass their entire drinking lifespan without encountering an orange wine. But for the seeker of vinous sensation, or at least of individuality, the opportunity to assemble and experience a (to my knowledge) unsurpassed collection of such wines in one place cannot reasonably be ignored. It is often said, and widely believed, that the geographical heart of the orange wine movement is the Friulian/Slovenian border. There’s a certain truth to that, especially as its controversial father-figure – Josko Gravner – is located there, but the world of orange wines is a wider one these days. Italy still provides a majority of the names, but there’s also Slovenia and Croatia, and even France and California are now in the game. But enough introduction. What about the wines? One of the vexing issues with the orange wine cohort is finding amenable food pairings. The one ingredient on which everyone seems to agree is sea urchin – not exactly everyday fare for most – but the trick seems to be focusing on the structure and weight of the wines rather than a particular set of aromas. For example, the familiar tannin/fat counterpoint works as well here as it does with similarly-structured reds. Still, there’s a bit of a guessing game involved, and even the most inspired matches don’t necessarily meld with the wines, which are inherently cranky, iconoclastic, and less than enthusiastic about playing well with others. For example, here’s what Convivio came up with. Despite the difficulties of the food/wine marriage, all of it was of uniform excellence. Did it enhance the wines? Sometimes, yes. Frequently, no. Yet I sincerely doubt any alternative choices would have improved matters. Such are the pitfalls of dining on the vinous edge. There was also a valiant attempt to impose a certain order on the tasting, which succeeded about as well as the food/wine pairings. Again, there is no fault to be laid at the feet (or the mind) of anyone responsible; the wines are just too unpredictable, and react to each other in surprising ways, confounding even the most careful organization. More successful were thematic micro-groupings…for example, a series of wines made by the Bea family, or a comparison of older Gravner and Radikon in matched vintages…from which certain continuities of style and differences in approach could be identified. The most unfortunate outcome of the organizational effort, however, was that it kept Levi Dalton on his feet, serving and explaining, for the vast majority of a tasting that one would have hoped he could sit back and enjoy. Alas. Perhaps there will have to be a sequel. The only other misstep, minor and soon corrected, was the temperature of some of the wines. The room was warm (and got warmer as the well-lubricated badinage escalated), so in an attempt to keep wines from overheating to unpalatability, ice buckets were employed. This was a fine idea, except that it meant many of the early wines were served chilled. This is almost always a mistake with orange wines for the same reason it’s problematic with structured reds: tannin overwhelms the wine, and complexities are muted. As the evening went on, this was corrected (another way in which our generous host was overworked), and even for the affected wines a little hand-warming of glasses soon brought the liquid into form. The notes that follow are not presented in the order in which the wines were tasted. And – an important caveat – they’re much shorter than I’d prefer. My typical orange wine note is a lengthy paragraph, which seems justified for wines that defy convention and easy categorization, but given the format and the speed of new arrivals, there was simply not much time to spend with each wine, teasing out each hidden notion and ribald suggestion. After the orange lineup (during which I apparently skipped noting one wine, though I do remember end-of-evening confusion over an extra glass before me), there’s a bit of a reddish coda. Frankly, after the relentless surreality of this tasting, it’s like a return to “real wine”…not more natural or authentic, but at least recognizable ground. I can feel my palate sigh in relief, but what’s more striking is the way that the sensory realms of my brain sort of unclench, as if they’ve been operating in a state of high tension for the last few hours. My favorites of the tasting? The Arboreus, certainly, and the Ageno. The 2006 Cà de Noci, the 2002 Lispida (but not the Terralba), the Vodopivec 2003, and most of the Gravner lineup. And, it must be said, the Wind Gap, which was the most pleasant surprise of the night…especially considering my much dimmer opinion of the winemaker’s former project. Disappointments? A few, most notably a couple of the Radikons, for which I cannot account (I’m normally a great admirer of the wines), and which I will thus chalk up to some brief weirdness in a food/wine, wine/wine, or wine/taster interaction. The other Cà de Nocis, both Zidarich bottlings…and I could go on, but won’t. Truth be told, a lot of these wines showed seams, lacks, and occasionally outright faults. However, I think there might be a reason for that performance. Read on. Tasting a bunch of wines is always fun (unless they’re terrible, which these most definitely were not) but from the above-noted level of focus and direction, one does hope that there are lessons to be learned and conclusions to be drawn. And I think there are. The claim has occasionally been made that the orange wine regimen, like oak or botrytis, so heavily marks the wines that it trumps varietal character, terroir, and even individuality. This set of wines shows that to be mostly nonsense; there’s plenty of diversity evident, and the wines are as different as one would expect them to be in any other context. Grapes do show, though perhaps not with the consistency exhibited in more typical wines. As for terroir, there is at least (in many cases) sub-regional continuity between these and more prosaic wines from their neighborhoods, though to say more than that would be to claim an illegitimate expertise. So why the caveat “mostly?” Because of the tannin, which in some (not all) of the wines enforces an identifiable structural similarity…a sort of pedal tone around which the other elements must work. When it plays a harmonious role, it’s the foundation on which the wine’s art and architecture are built. When it doesn’t, it’s the squawky drone of a wheezing, decrepit bagpipe. Another much-asked question is whether or not orange wines age. There’s really not enough evidence here to say for sure. Certainly the few older wines present seem to have aged just fine, softening in the way one would expect tannic wines to soften. As the tannin melts, creamier textures emerge. That said, many of these wines very much rely on that tannin for counterpoint. Once it's gone, the result is a lushness almost entirely opposite the face these wines present in their youth. As with any aging process, opinions will differ on the stage at which the wines are most intriguing. The only tentative conclusion I feel safe drawing is that the curious can probably age the better of these wines without fear of precipitous decline. On the other hand, one may reasonably fear biological instability in those wines that avoid filtration, sulfur, and other methods of stabilization; while their structure is itself preservationist in nature, not all of the wines are entirely clean, or have avoided oxidation. I would not age the more natural wines absent a properly-controlled cellar. Some of the wines I’ve always felt I loved were, in this context, less impressive than expected. Others performed above their pay grade. Perhaps surprising, perhaps not, but this is why one holds tastings…to learn just this sort of thing. I must also presume that, as in any quick-take tasting of a fair number of wines, concentration and intensity are more favorably received than they might be in isolation, The corollary conclusion that delicacy is inevitably devalued or even lost must also be considered. As ever, such tastings do not replicate the experience of a slow encounter with a single bottle. Perhaps the most surprising conclusion, for me, is that I didn’t enjoy tasting these wines in this particular fashion nearly as much as I had hoped. The dinner, the tasting, the camaraderie…all were enormous fun, and definitely worth the participatory effort (though I will admit to a savage headache the next morning). But while I adore a lot of these wines in isolation, in concert my affection for them dimmed, and I was surprised how indifferent I was to the qualities of all but a few bottles. It could be that the accumulated negativity is a result of the rather overpowering and aggressive nature of the wines, which were more of a chore to slog through than I’d expected. Also, there was an extremely draining mental aspect; teasing out the complexities and the wildly individualistic essences of orange wines is a difficult enough task to begin with, but doing it as bottles fly past, food arrives, and tablemates chatter away is a perhaps insurmountable challenge to even the most intense attempt at concentration. I was tired at the end of this tasting, but mentally far more than physically, and even writing about the experience several days after the fact brings forth a clear physical sensation of sensory fatigue. It would be intriguing to explore this matter further. But as I write this, my overriding emotion is that I’d like – or perhaps I need – a short break from orange wines. My curiosity has been somewhat over-satisfied, and my palate is suffering burn-in. In the end, it turns out that the scolds and the finger-waggers were right: it’s possible to show too much skin. Great write up. your recall of the evening is MUCH better than mine! Well, that's why I write stuff down. Otherwise, forget it. Unfortunately all is in Italian, I don't know if you can read that. Thank you. Very interesting thoughts, to which I responded on your blog. It took me a long while to read it in a language I love but don't speak very well, but it was worth the effort. Awesome. Most comprehensive list of Orange wines I've seen. Gotta go out and get some of these. Well done, Thor. If indeed there is a sequel, I'd love to come up for it (hint, hint -- just in case Levi's tuning in). For some, orange wines are anything but natural, no matter how historical a vinification they might represent. The transformation of a white wine into such a state, the argument goes, is as profound a manipulation as any. I can see this argument being made, in the sense that choosing skin contact will heavily influence the final state of the wine. However, I don't really see making a white with skin contact as any more manipulative than making a white wine without skin contact. It's just one of many choices/decisions a winemaker faces. I think we all need a little break at the moment, but I can conceive a sequel. Maybe we'll take the show on the road, though it would be hard to beat the combination of Levi Dalton's commitment and Convivio's fabulous food. Regarding the manipulation question, I raised it because it's one of the most common objections to the style, but I should have been clearer that I don't subscribe to the charge. I think it was pretty clear that you're not a subscriber, Thor. Perhaps I should have made that clearer.... I was addressing the argument itself. Great roundup! LOVE the Wind Gap Pinot Gris, which we carry in our CA focused retail shop. I generally find the Scholium stuff undrinkable but I have to make an exception for the Prince in his Caves, which is a Sauvignon Blanc that I believe would qualify as an "orange wine." Cheers. A very interesting read, Thor. As the organizer of the unofficial "sister" orange wine event in San Francisco, which took place the following night, I had to deal with the temperature issue as well. Based on previous experiences with several of the wines, I erred on the side of serving them too warm. This worked well for the first half of the evening, but was a bit of a problem later in the evening, as our tiny restaurant heated up. But even so, there was simply no room for ice buckets on our tables. Jen, thanks. I've love to explore the Wind Gap in a little more isolation, but I don't expect we'll see it in Boston anytime soon. Next trip to the West Coast, perhaps. As for Scholium Project, "The Prince in His Caves" was one of my first experiences with the label, and while I didn't adore it, it was at least interesting. It was all downhill from there, alas. That's why I was as surprised about my positive reaction to the one in these notes. Slaton, terrific notes, thanks. I agree that temperature is a hassle, especially given the variability of styles; some wines really need to be room temp, others need to be chilled, and some are unrecognizable after mere five-degree shifts. Levi did an admirable job trying to manage this at our tasting, but there's still a highly-interactive component to it. I love this post. I have read several others about this particular tasting and yours wins, hands down. My first thought was how do these wines age, but you so extensively described the older wines that my curiosity was satisfied. Ultimately, I have a 'why bother' reaction to all of this, (possibly because I am more interested in viticulture), but I don't feel a need to drink every type of whatever-way-fermented grape juice to prove I am a bigger wine lover than my neighbour...I just drink what I like. In this way I don't have to take a break from anything I wasn't too fussy about in the first place! I have read several others about this particular tasting and yours wins, hands down. Ultimately, I have a 'why bother' reaction to all of this, (possibly because I am more interested in viticulture), but I don't feel a need to drink every type of whatever-way-fermented grape juice to prove I am a bigger wine lover than my neighbour...I just drink what I like. I do enjoy these wines for the experience, and I do enjoy constantly broadening my experience, but with experience has come actual affection. I haven't been without a little selection of orange wines for a few years now, that selection is growing, and I'm increasingly intrigued by the category. Part of that is that the category gets broader with each new entrant, which means more for me to explore. I'm with Vinogirl. It didn't sound like you enjoyed them. I enjoyed many of the wines, and I enjoyed the opportunity to taste them this way. But as noted in the summary text, when it came down to it tasting them in this fashion diminished my overall enjoyment of the wines. I just don't think they're suited to big comparative/competitive groupings like this...not that I think many wines are, but rather that this are particularly ill-suited to the collation. I've had a few orange wines since the tasting that I've enjoyed more, and perhaps more relevantly I've enjoyed them as much as I'd expected. But were I to do this again, I'd go in knowing that the pleasure would be strictly academic. Excellent and interesting post. Thanks. Thanks, Elisa. Good luck with the MW.